Lower limb orthotics are external devices that are attached or applied to a lower limb to improve function by providing support, controlling motion, reducing pain, correcting deformities and preventing progression of deformities. Our clinicians advice people and helps them get the right orthoses that treat or prevent conditions. At HOPE, our goal is to provide you with the best lower limb orthosis that would help you restore functionality to your legs. Our expert team helps you get back to activities that your ailments or injuries were holding you back from. The term AFO is an acronym that stands for Ankle Foot Orthosis ( AFO ) and describes the part of the body that the brace encompasses. An ankle foot Orthosis (AFO) controls the range of motion in your foot and ankle and helps to stabilize its position. It is used to treat various neuromuscular (nerve and muscle) diseases and disorders and to also provide functionality after an injury or a surgery. Good foot and ankle alignment is vital for balancing and distributing weight when you are standing and walking. 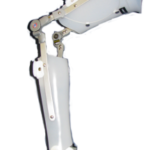 The AFO will be designed to meet your specific needs. As each person is unique, so is his or her response to treatment. As you adjust to this new and proper alignment, you may experience some discomfort. The adjustment period usually ranges from one to six weeks when the recommended wearing guidelines are followed. You are provided with customised and fabricated AFOs that suit your particular and specific needs. Your AFO has been prescribed for you and is intended for your use only. Your AFO is designed to conform to the shape of your foot and ankle and may feel slightly ‘strange’ due to the realignment of your lower limb, and pressure redistribution. It will therefore require a gentle breaking-in period. 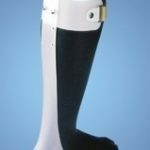 When you are first fitted with your AFO you should wear into it gradually. 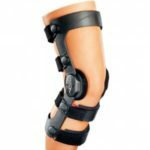 This allows you to get used to wearing the AFO and allows the skin to gradually build up resistance to the pressures which the brace is applying. You should check your skin regularly during the first few weeks. You may experience some general muscle aches until you are used to wearing the AFO. If you experience any pain or discomfort, remove the AFO from your shoes for at least two to four hours, and then try again. If pain persists, stop wearing the AFO and make an appointment to see us for an adjustment. You will achieve the greatest long-term benefits when you consistently wear your AFO every day. There may be cases where your doctor recommends a different wearing regime, such as only at night or for specific times. These instructions will be given to you when your AFO is fitted. Select good shoes with proper support and always try them on with the AFO in place to ensure proper fit and comfort. 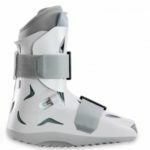 The best type of shoes to wear with your AFO feature a closed back and toe; come up over the top of the foot like laced-up sport shoes; low heels; a removable liner; and a slightly wider width to accommodate the AFO. Be sure to wear stockings or long cotton socks (which are a little higher than the top of the AFO) to minimize the possibility of skin irritation. During use, ensure that footwear is secured as tightly as is comfortable. Special shoes for children are available at Hope Center to wear with AFOs. Your skin should be inspected regularly, especially in the first few weeks after you have been fitted with a new AFO. A close fitting orthosis can sometimes cause some redness on the skin around the edges of the orthosis and where the AFO is applying corrective pressures. Check your skin thoroughly especially over bony areas and around the edges of the AFO. If you see a red area that does not go away within 30 minutes of removing the AFO, or notice a break in the skin or blisters you should stop wearing the AFO and make an appointment with us to have it adjusted. Cleaning: Use an antibacterial soap and warm water to wipe the inside surfaces of your AFO. Towel dry the AFO completely before putting it back on. Avoid drying in direct sources of heat (such as on the heater or using a hair dryer) as this can deform the plastic. Straps and Padding: The straps and padding may become worn and can be replaced. To arrange repairs please contact Hope Center. Plastic: Inspect the plastic regularly, checking for any cracks or areas of fatigue. Never attempt to repair, trim or adjust the AFO yourself, if a problem arises contact Hope Center immediately. Joints: Some AFO’s may have joints at the ankle. These should be checked before each time the AFO is used looking for any dents or cracks and for making sure that all rivets and screws are secure. We would recommend that your brace is reviewed by service provider at least once every 12 months to ensure the device is still meeting your needs and to check for any wear and tear. Children may need their AFO changed more often as they grow or gain weight. We would recommend that your brace is reviewed at least every six months. Never attempt to repair or adjust your brace yourself. If you are experiencing any problems or have questions regarding your brace, please contact Hope Center. Please remember to bring your AFO, when attending appointments with us even if it is broken or no longer fits. Hope provides ankle braces to patients for a variety of reasons. An ankle brace may be required to support a weak ankle following an ankle sprain or to realign the ankle and foot. 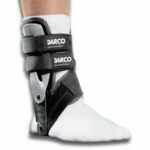 An ankle brace can be an off the shelf item or a custom made orthotic made from a cast taken of the ankle and foot. The off shelf ankle brace is most often a soft fabric support which is used to provide gentle control to the less stable ankle. The science associated with ankle injuries and rehabilitation is complicated, therefore we would advise the patient to arrange an appointment prior to wearing on ankle brace. 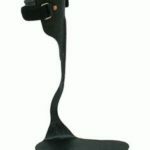 Custom made ankle orthotics are made after assessment and casting. Special material is used to fabricate these orthotics which are light weight and skin friendly. Knee orthoses is the best option for you if you are facing knee instability, joint contracture and/or tightness, moderate to severe ACL (anterior cruciate ligament), MCL (medial collateral ligament), and LCL (lateral collateral ligament) instabilities, unicompartmental knee osteoarthritis, ligament instability, post operative knee stability and various other knee related disorders and deformities. Our experts will guide you and custom fit you with an orthosis according to your needs that would help lessen your pain enable you to be active again. 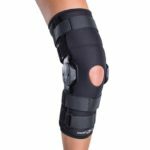 There are different types of Knee Orthosis available at Hope Center from custom made to highly state of the art braces according to the functional demands and age of the patient. The term KAFO stands for Knee Ankle Foot Orthosis and describes the part of the body that the device encompasses. The orthosis extends from the thigh to the foot and is generally used to control instabilities in the lower limb by maintaining alignment and controlling motion. Instabilities can be either due to skeletal problems, muscular weakness and paralysis. With this in mind, the indications for use of a KAFO are many and varied. Your doctor will choose the right KAFO for your needs keeping in mind your own goals and safety. KAFOs are made of special plastic and light weight metal. 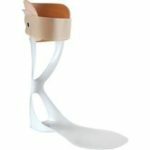 It has a moulded plastic thigh and below knee section which fits inside you shoe. The KAFO will also incorporate some kind of knee joint. We make it according to your size and indication. Your KAFO has been prescribed for you and is intended for your use only. Since there are many different reasons to use a KAFO, there are many different designs. Each design has its own special features and its own specific way to be put on properly. We will instruct you on the correct way to put your KAFO on and adjust the straps in order to make the best use of it. Your KAFO is designed to conform to the shape of your thigh, foot and ankle and may feel slightly ‘strange’ due to the realignment of your lower limb, and pressure redistribution. It will therefore require a gentle breaking-in period. When you are first fitted with your KAFO you should wear into it gradually allows you to get used to wearing the KAFO and allows the skin to gradually build up resistance to the pressures which the brace is applying. You should check your skin regularly during the first few weeks. You may experience some general muscle aches until you are used to wearing the KAFO. Start slowly, only wearing your KAFO for a maximum of one hour on the first day. Increase the wearing time each day, by an extra 30 minutes to one hour until you are comfortable wearing your KAFO all day or as much as it is required. If you experience any pain or discomfort, remove the KAFO for at least two to four hours and then try again. If pain persists, stop wearing the KAFO and make an appointment for an adjustment. Select good shoes with proper support and always try them on with the KAFO in place to ensure proper fit and comfort. The best type of shoes to wear with your KAFO feature a closed back and toe; come up over the top of the foot like laced-up sport shoes; low heels; a removable liner; and a slightly wider width to accommodate the KAFO. Dress shoes and sandals are not recommended for these reasons. Be sure to wear tights or long cotton socks under the KAFO to minimize the possibility of skin irritation and improve comfort. Special shoes for children are available at Hope Center to wear with KAFOs. Your skin should be inspected regularly, especially in the first few weeks after you have been fitted with a new KAFO. A close fitting orthosis can sometimes cause some redness on the skin around the edges of the orthosis and where the KAFO is applying corrective pressures. Check your skin thoroughly especially over bony areas and around the edges of the KAFO. If you see a red area that does not go away within 30 minutes of removing the KAFO, or notice a break in the skin or blisters you should stop wearing the KAFO and make an appointment to have it adjusted. Cleaning Use an antibacterial soap and warm water to wipe the inside surfaces of your KAFO. Towel dry the KAFO completely before putting it back on. Avoid drying in direct sources of heat (such as on the heater or using a hair dryer) as this can deform the plastic. Straps, Padding and Linings The straps, padding and leather lining may become worn and can be replaced. To arrange repairs please contact Hope Center. Plastic Inspect the plastic regularly, checking for any cracks or areas of fatigue. Never attempt to repair, trim or adjust the KAFO yourself, if a problem arises contact us immediately. Joints KAFOs may have joints at the ankle and knee. These should be checked before each time the KAFO is used looking for any dents or cracks and that all rivets and screws are secure. If your KAFO has joints that lock when you are walking you should check that both are fully locked before mobilising. If you fail to do this it can cause serious damage to the KAFO and could affect the stability of the device and ultimately your safety. If the KAFO has spur ends that go into a socket in the heel of your footwear, check that there is no excessive wear to the spur or the socket and that the socket is secure in the heel of your footwear. Keep the joints clear of any dust and dirt and occasionally apply a small amount of Vaseline to the spurs (if you have them) and the knee joint. This will reduce the wear. Lubrication should be avoided from certain knee joints and contact Hope Center for further information. Adjustments can be made to your KAFO and we recommend that your brace is reviewed at least once every 12 months to ensure the device is still meeting your needs and check for any wear and tear. If you work in a particularly dusty environment or are involved with heavy manual work your KAFO should be reviewed more often. We would recommend your KAFO is reviewed every six months to ensure it continues to be safe to wear. Children may need their KAFO reviewed and replaced more often as they grow or gain weight. We would recommend that your brace is reviewed at least every six months. Never attempt to repair or adjust your brace yourself. If you are experiencing any problems or have questions regarding your brace, please contact us.